Like he had done hundreds of times, Steve decided to go fishing for trout on one of his favorite streams. There had been some stress in his life and being alone on the creek would certainly bring some welcome "down time." The weather was nice. The stream was serene and the trout were biting. You could not have asked for more. Then I have met stranger, there for the same reason, and his life would begin to change for the better. 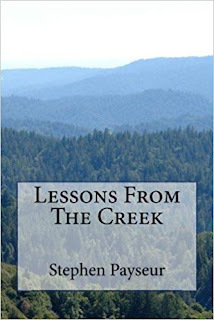 Part and fact fiction, Lessons From The Creek begins the journey of one man's quest toward spiritual growth. It is a small story with a big influence, and we all wish we could find in our lives. Sometimes the biggest most profound things happen to us seemingly by chance. Or, is there ever any real chance in our lives? Sometimes things happen for a reason, at the time and the place that we need them most.This is a story of one of those moments.